Material of Construction : Stainless Steel 202, 304 or 316 and / or Mild Steel. Manufactured using 304 grade stainless steel, the AIRA Grab Bar delivered by us is highly durable and has an aesthetic appeal. These products are elegant and made available in matt or glossy finish. AIRA grab bars are ideally suitable for glasses of 8 mm to 12 mm and are extensively used in commercial establishments and domestic households. - Provide a stable, reliable handhold. - Secure mount design allows for easy, secure installation at any angle. 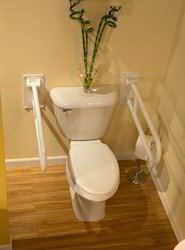 Backed by expert and experienced professionals, we provide Strong Grab Bar.